Sometimes for breakfast you want something substantial but low in carbs. This portobello egg and kale low carb breakfast with eggs, kale, bacon and cheese is low in carbs, but high in protein and has the flavor that you crave! It’s Saturday morning and I’m thinking about what to fix for breakfast and keep it healthy. I want it to be more substantial than a week day meal. My hubby always eats oatmeal and berries for breakfast during the week. So I look in the fridge and see mini portobellos, eggs, bacon, kale (oh yes that is healthy, I have to use kale), red pepper and green onions. 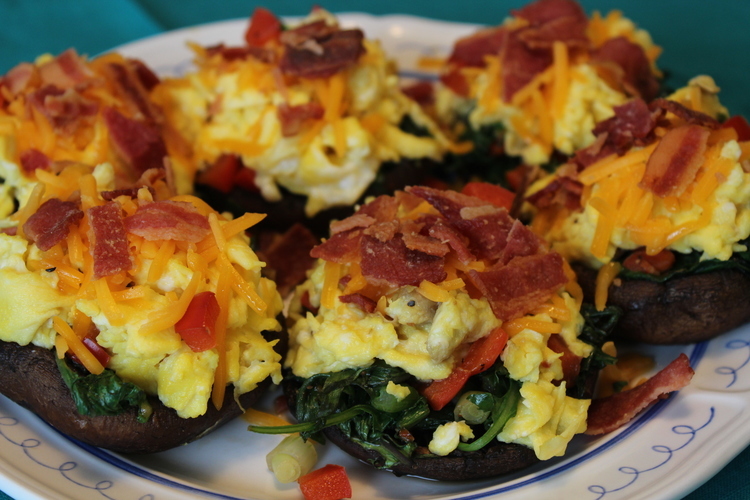 So I think, hmm, how about stuffed portobellos with sauteed kale and scramble eggs. I’ll top them with a little cheese and bacon for more flavor. Viola! That’s it. Here are some pictures of my creation. I served these with Sriracha for some added spice. Let me know what you think. They are healthy, low fat, and no carbs. I doubled the amount of kale and ended up only using 4 eggs for the 6 mini portobellos. I used 3 pieces of bacon that were cooked in the microwave oven. Lightly brush olive oil on mini portobellos and salt and pepper. Bake in oven at 350 degrees for 10-15 minutes, until soft but still firm enough to hold the toppings. 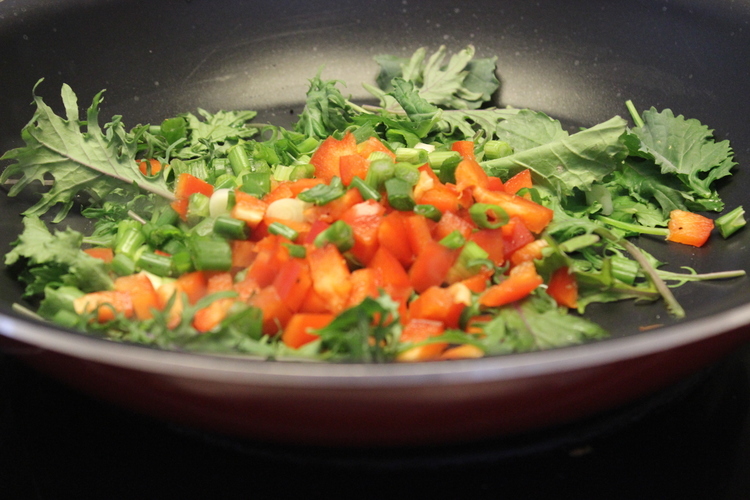 Lightly saute the kale, red peppers and green onions in 1 T olive oil while mushrooms are cooking in oven. Scrabble eggs in non stick pan and set aside. The assembly is easy, first the portobello, then place the kale mixture on top and then the scrambled eggs. To all with a light sprinkling of cheddar cheese and crumbled bacon. YOU MIGHT WANT TO EAT 2 BECAUSE THEY LOOK BIGGER THAN THEY REALLY ARE. I SPRINKLED MY PORTOBELLO EGG MINIS WITH SRIRACHA. MAKES THEM SPICY AND DELICIOUS.! Wipe mushrooms clean and remove stem. Brush with olive oil and salt and pepper. Place on baking dish and bake at 350 degrees for 10-15 minutes until mushrooms are juicy but still firm enough to hold toppings. While mushrooms are baking. Saute baby kale, red pepper and green onions together in 1 T. olive oil and lightly salt and pepper. Wipe pan clean and add 1 T. olive oil. In a bowl, whisk eggs with a little salt and pepper and scramble in the prepared pan. Set aside. When mushrooms are done. Top with kale, red pepper, green onion mixture divided between the 6 mini portobello mushrooms. Top with the eggs divided up between the 6 portobellos. Top each mushroom with 1 T. of cheddar cheese and the crumbled bacon. Serve 3 with 2 mushrooms each. 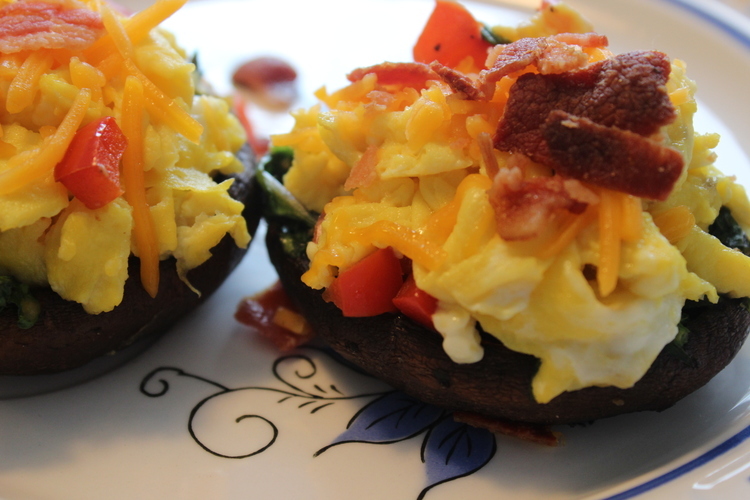 Sriracha is a great, spicy topping to dot on top of your portobello egg minnies. IF YOU LIKE THIS RECIPE, HERE IS ANOTHER GREAT RECIPE FOR BREAKFAST THAT IS BOTH LOW CARB AND HEALTHY!